Plumbing & Heating Magazine is the only all-Ireland trade publication of its kind. Published bi-monthly, we are dedicated to informing readers about the latest developments in the plumbing and heating industry in both Northern Ireland and the Republic of Ireland. Our articles range from current trends, new legislation and corporate events through to case studies, industry directives and information on national and local issues. However, our main focus is on supplier profiles, company profiles and personalities plus products and services offered by businesses across the island of Ireland. 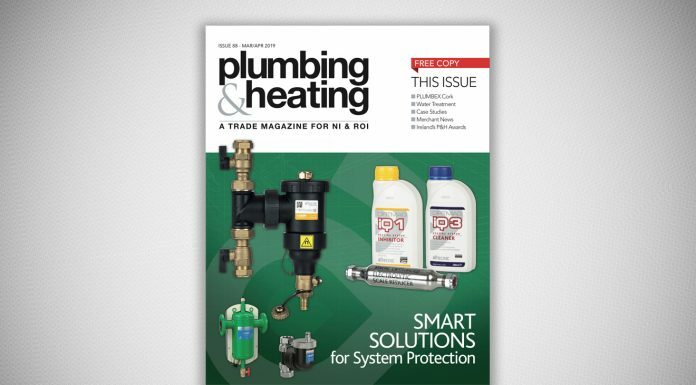 Based on the continuing success of Ireland’s only dedicated trade publication for the plumbing and heating industry, www.plumbingmag.com provides our readers with 24/7 access to the latest information from this diverse sector. Our long-standing experience of the industry and our commitment to delivering expert commentary, industry news, detailed product information and company profiles is reflected in the informative content that has created one of the leading online portals for the plumbing and heating industry. The commitment to feature only products and services available in Northern Ireland and the Republic of Ireland makes the Plumbing & Heating Magazine the ideal medium for companies wishing to reach customers in this specialist sector. The bi-monthly magazine is distributed free, on a controlled circulation of approximately 6,500 copies to named individuals including registered plumbing and heating contractors, installers, heating engineers, M&E consultants, M&E contractors, specifiers, project engineers, merchants, distributors, builders, councils, government departments, public sector bodies and anyone else associated with this sector.